It is hard to find anything that can compare with the fun you and your entire family can have when you take a trip to Disneyworld. 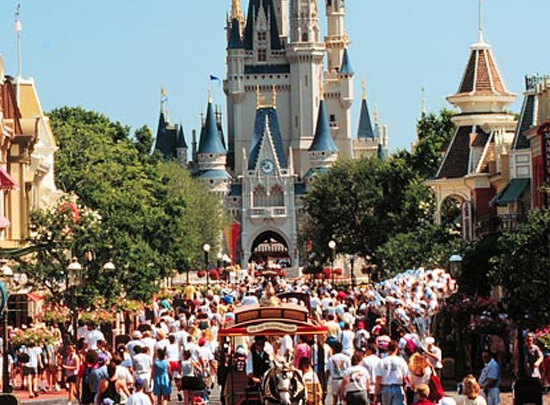 Disneyworld is filled with so many different rides and attractions that there is sure to be something for everyone in your group to enjoy and the memories you form will ultimately last a lifetime. But in order to get maximum enjoyment out of your visit to Disneyland it is important to know what to wear when you go. • Shoes: When it is all said and done you will probably walk a few miles while inside of Disneyland so you need to prepare your feet for that. Be sure you have on a comfortable pair of sneakers and be sure they are already broken in. A new pair of sneakers may look great on your feet but if you wear them for the first time while visiting Disneyland you will leave with much more that memories; you will leave with lots of blisters as well. • Shirts: T-shirts and tank tops are in tall order for Disneyland. Remember you will be moving around all day and anything that is thick is sure to be soaked with sweat before the day is done. If you feel the weather may get chilly you can bring a light sweater or a wind breaker with you and tie it around your waist. That way you will have it if you need it and it stays out of the way if you don’t. • Shorts: You will want to go with shorts even if it is a bit on the chilly side. With the constant movement from all the walking you will be doing your legs are not going to get a chance to get cold. If it is really cold then a lightweight pair of pants will do you better than jeans because you will still sweat and jeans are only going to absorb that sweat which will make for a sticky and uncomfortable day. • Accessories: Besides a camera and a couple memory sticks there are a few things you will want to bring with you. A hat can be a great way to keep the sun off your head and help shade your face. Be sure the hat is a lighter color as a darker color will only absorb the sun and make you feel hotter that you already are. Sunglasses with a high UV protection are a good idea too as you will be exposed to the sun for long periods of time. The most important thing to remember though is sun block. You will want to apply and reapply so that you don’t end your Disney trip looking like a lobster. The last thing you will need to bring with you is lots of money. Disneyland is by no means inexpensive; but it sure is a lot of fun.